In 1970’s Manchester, Steven Morrissey (Jack Lowden – Dunkirk, A United Kingdom, ’71), an introverted, uncompromising teenager, finds himself frustrated with his working-class existence. With dreams of a successful music career being dampened by his run-of-the-mill job at the local tax office, Steven finds solace in the city’s underground gig scene where he meets Linder Sterling (Jessica Brown Findlay – Downton Abbey, The Riot Club) – an intelligent, self-assured artist – who encourages him to make his ideas of superstardom a reality. Culminating in his first meeting with Johnny Marr, Englnd is Mine is a feature length origins story based on the early life of Morrissey, the outspoken former lead singer of seminal British band The Smiths. Directed by Academy Award and BAFTA Award nominated Mark Gill (The Voorman Problem) and produced by Baldwin Li (The Voorman Problem) and Orian Williams (Control), the film will have its world premiere at the closing night of this year’s Edinburgh International Film Festival on Sunday 2nd July. England Is Mine is in cinemas August 4. Morrissey's mother and friends have publically issued statements distancing the artist from the film. James Maker, who grew up and played with the Smiths frontman, has called the film "historical fiction." 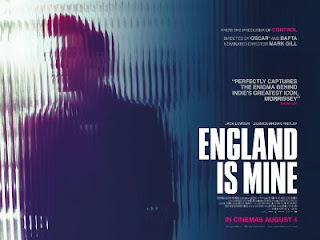 The unauthorized Morrissey biopic England Is Mine premiered yesterday at Edinburgh International Film Festival.